The product is made out of plastic, strongly built to store heat better, and keep it from breaking in case of strong shocks. However, you can easily carry it around due to its lightweight build, so you can take it with you if you go on a tiring trip (provided that you have a mesh, because the product functions on electricity). It is also equipped with an anti-slip surface, to prevent you from accidentally hurting yourself. Conair FB3 is an optimal tool for those in search of a product combining functionality and an affordable price. 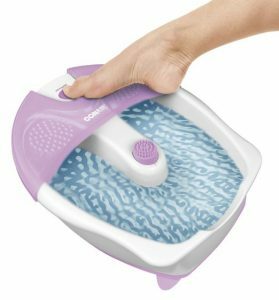 The product includes a vibrating function, which activates when you touch it with your toes, so you do not have to bend over and use your hands. It has a double insulation to keep the water warm, therefore you can soak your feet until you get bored or fall asleep. The product comes equipped with a massage attachment and additional massage surface placed on the splash guard. This way, your legs can enjoy a full massage experience and you do not have to worry about your carpet or floor. The item measures 42 cm in length and it is wide enough to fit the tiniest or the biggest feet inside it. But, even so, it is small enough to be placed in many spaces around the house – so no worries about storage space. Your feet navigate through many dangers during the day: bad shoes, a hole in the pavement, long periods of standing up if your job requires it, walking long distances, etc. There is nothing that relaxes your feet as intensely as a warm bath and a vibrating massage. Massages and warm baths have been known to improve blood flow for a long time now. The vibrations combined with warm water stimulate this biologic process. This is helpful for those who have bad peripheral blood circulation and those who exercise a lot, because it helps ameliorate muscle tension. Our feet are one of the driest parts of our body and sometimes it is hard to prevent them to take on an unaesthetic appearance, or being affected by infections and other medical issues. The best you can do is to keep them as clean as possible. A very easy way to do so, is to prepare a warm bath with various oils and soaps, wait for your feet to soak well, and then use a pumice stone to remove dead skin. Use a pedicure set to clip your toenails, remove your cuticles and then apply moisturizing lotions and creams to soften the skin. You can do all these with the help of your new foot massager. 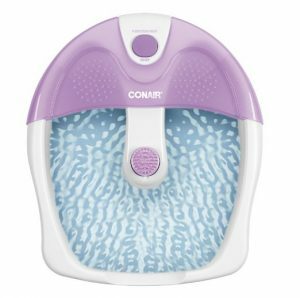 Conair FB3 is a great product for those looking for an easy to use item that also comes with satisfying features. Though not the most performing foot massager on the market, this specific item will offer you a great way to relax at night and offer a subtle, calming massage as well. Due to its capacious size, it is fitted for any foot size and plastic composition makes it easy to take it with you wherever you go.